MARCH 2014 UPDATE: The [Rof South Florida exhumed 55 bodies from the cemetery. 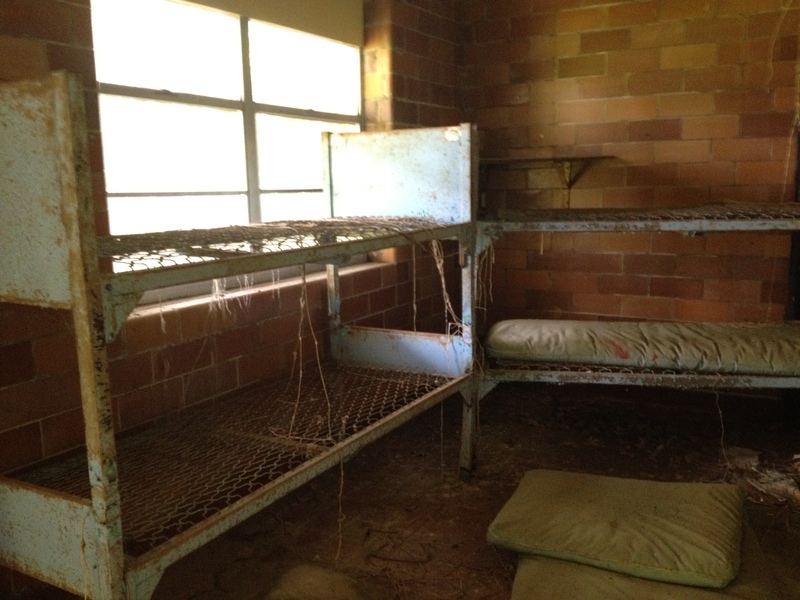 In 1937, my great-uncle, Robert Stephens, was buried at the Dozier School in Marianna, Florida, with perhaps up to 100 other boys who never came home after being sentenced to the notorious reformatory. 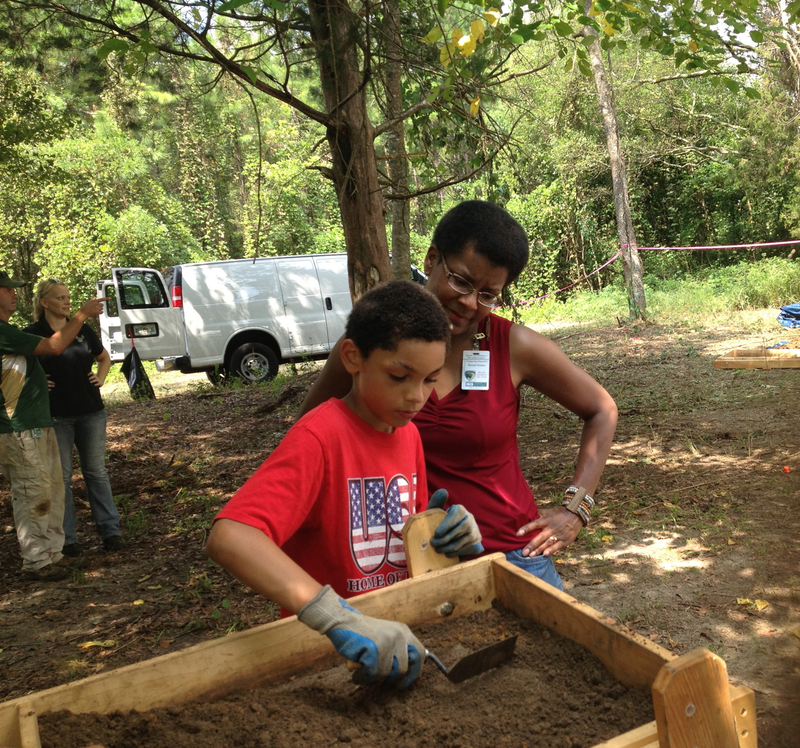 Last September, I went to Marianna with my father, husband and son to observe the beginning of exhumations at the site. I started writing this post the first week of September in 2013, and I’m only completing it in January of 2014. This was hard to write. This is not only a story about the past. This story illustrates why our criminal justice system—racially biased and more and more dependent upon private prisons—is itself in dire need of reform. The deputy sitting parked in his cruiser at the tree line gives us a slate with a form to sign, passes out badges we clip to our clothes. Then he directs us to Boot Hill, the cemetery hidden in the woods on the former grounds of the Arthur G. Dozier School for Boys in Marianna—Florida’s most infamous reformatory. And so my husband, Steven Barnes, drives on with a carload of us: me, our 9-year-old son, Jason, and my 78-year-old father, civil rights attorney John Due. It’s only ten-thirty in the morning in Marianna, but the day already promises to be hot. We drive into the moss-draped woods. We are puzzling over what the mudhole might look like when Jason spots it—a huge puddle of thick mud on the roadside. Suddenly we are at the site of unearthed secrets. Makeshift crosses mark earlier visitors’ best guesses about where the dead are buried beneath the red soil. 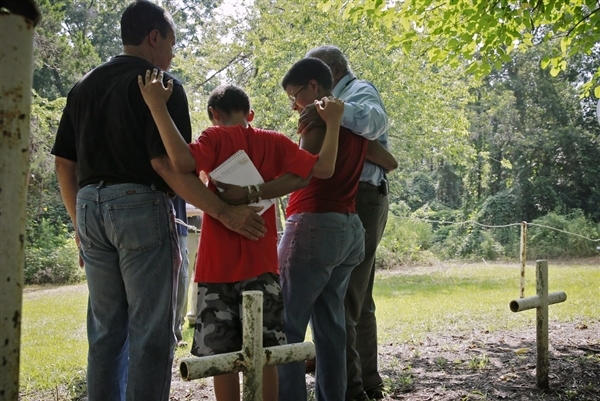 Saturday, Sept. 1, 2013, after a lengthy fight waged by families and survivors white and black, journalists, the NAACP, the Florida Attorney General’s office and the University of South Florida, researchers began their careful digging far from the crosses—where radar equipment used by USF forensic anthropologist Erin Kimmerle’s team found signs of unmarked graves. One of the boys who died was my great-uncle Robert Stephens, who was reportedly stabbed to death by another boy in 1937. But in the fog of misery and mystery, how can we have blind faith in the claims made by Dozier? Until the Florida Attorney General’s office called me in March, I had never heard about Robert Stephens, the uncle of my late mother, Patricia Stephens Due, whose name was listed in the Dozier School records as one of the boys who died there. He was fifteen when he died. My aunt, civil rights activist Priscilla Stephens Kruize, says she never heard about him or his death. I do not know if my grandmother ever knew that her husband had lost a brother there. Robert Stephens died two years before my mother was born. Seventy-six years later, in 2013 Rev. 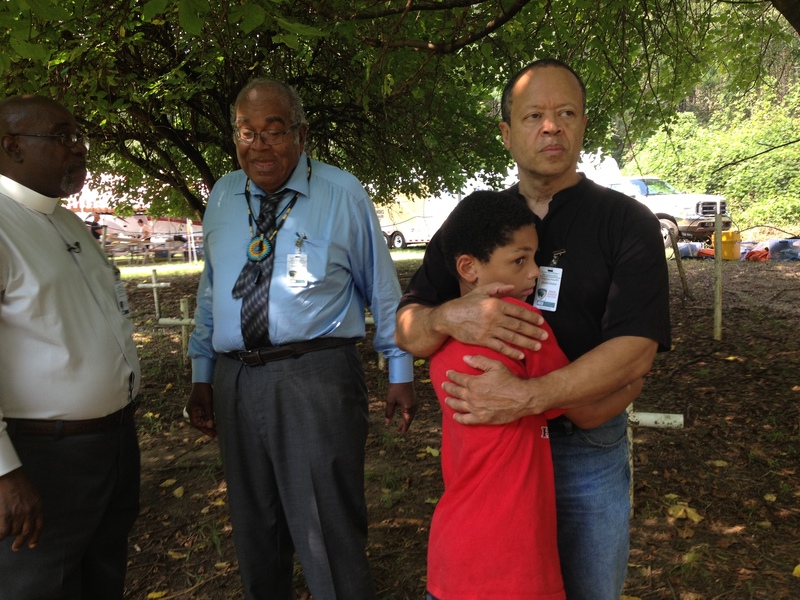 Ronald Mizer of St. James AME Church, the Jackson County NAACP president, led a prayer with my family beneath the mossy trees as researchers paused their digging. My father, husband, son and I held hands and bowed our heads. Afterward, my husband planned to take our 9-year-old son, Jason, to a nearby tourist attraction while my father and I stayed behind to watch the excavation. But Jason surprised us all: he chose to put on gloves to sift through the soil with researchers. 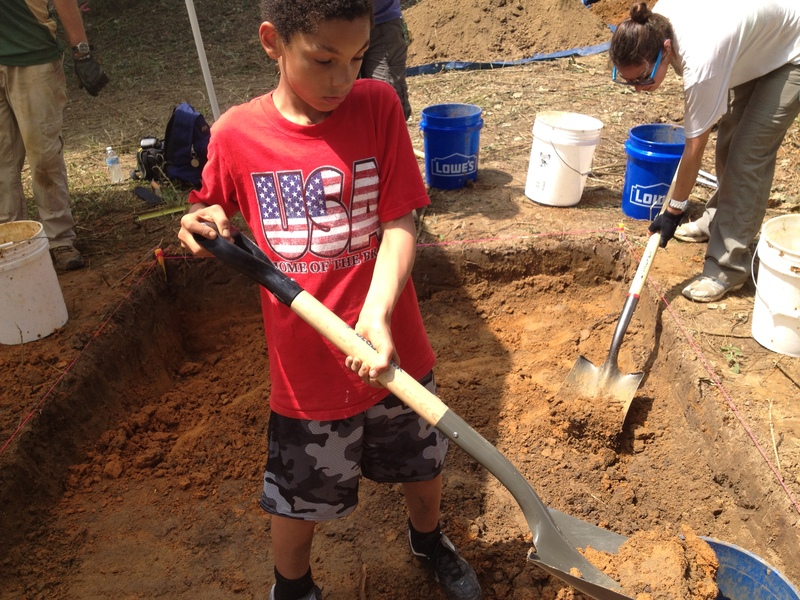 Jason picked up a shovel to try to unearth his family’s past. “Look at that!” my father kept saying, watching his grandson at work. This unburying has been a process of years. Of tearing down the woods. Of digging shallow trenches. Of revealing long-held secrets. Of searching for anyone who might remember the dead—who might have heard a lost boy laugh or cry, or who lay awake nights in worry. Some of the stories are so old, dating back to 1900, that no one is left to remember. My father, husband, son and I came to mourn a stranger who was far from a stranger. Though we never knew of Robert Stephens, his loss had a ripple effect on my mother’s father and therefore on my mother. That loss shaped attitudes, family dynamics, dreams. What is any family’s incalculable toll when a child never comes home? Has died violently? Was likely imprisoned unjustly because of his skin color, like so many of our children still are today? Not everything that’s buried is gone. 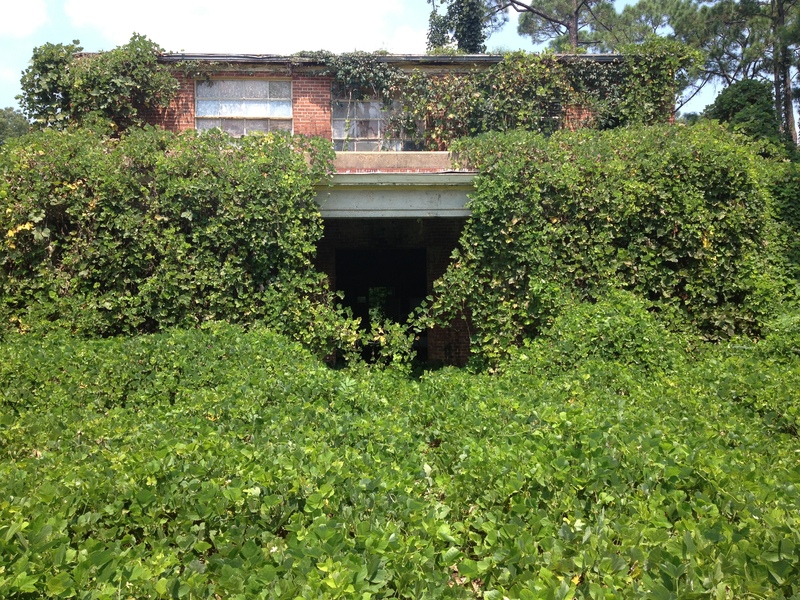 The stories from the Dozier School’s history are harrowing. The more you learn, the worse it gets. The Dozier School operated from 1900 to 2011. It was finally closed in 2011 after a history of investigations and complaints. A Dozier School building today. According to the Tampa Bay Times, which pioneered coverage of the story, in 2008 survivors came forward with stories of widespread physical and sexual abuse. In the CNN interview linked below, a family member alleges that her brother was murdered at the hands of school guards. In 2009, the Florida Department of Law Enforcement said it found no evidence of foul play at the site. But in 2012, USF’s Kimmerle used the ground penetrating radar she has used to investigate war crimes around the world for the United Nations—and she found traces of 19 more grave shafts than the FDLE. There are more bodies than there are records for. School records show that another 22 boys died at the school, but their bodies were never accounted for. 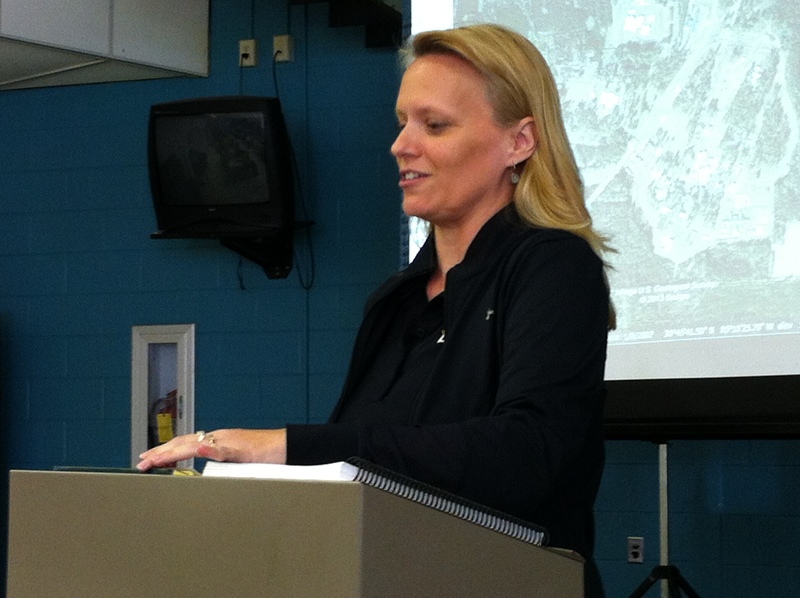 Kimmerle believes most of the boys buried there were black, though both black and white students died at the Dozier School. Who are the dead boys, and how did they die? Reports show that a fire claimed 12 lives. A flu epidemic claimed others. But it doesn’t account for so many dead. Ovell Smith Krell’s brother Owen Smith was sent to the school in 1940, and she told CNN that her family never saw him again. School administrators reported that he ran away and later died of pneumonia, but a former Dozier student later told her Owen was shot and killed by Dozier school administrators when he tried to run away across an open field. Dozier School survivor Robert Straley told CNN that other boys were killed there too. HEAR THEM ON CNN HERE. Black survivors of the Dozier School have a Facebook page. As one survivor, Charles Stephens, described it last April, two men held him down on a table while a third man lashed him. He said his back was so torn to shreds that his shirt had to be removed by a doctor. His parents were unable to visit him that weekend. He never told them about the horrors of his beatings, he said—he told the story for the first time in a room full of strangers meeting to advocate for exhumations at the school. 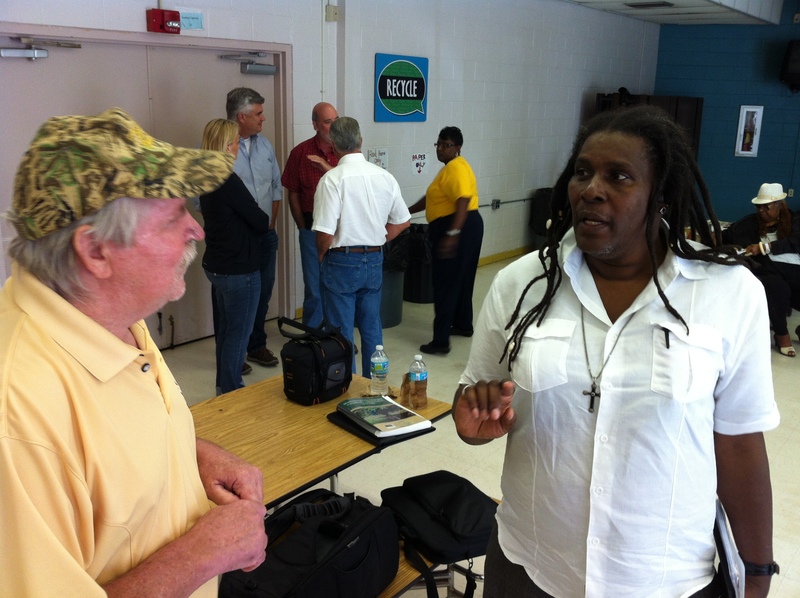 Charles Stephens, left, and Cocomo Rock, right, were both at the Dozier School. They traded accounts at a meeting near the school in April, 2013. “I stayed in the infirmary two weeks after my last beating,” said Stephens (no relation), who spent 18 months at the Dozier School in the 1960s, when he was 13. At age 61, the Panama City resident told his story publicly for the first time at the meeting last April. Charles Stephens is white. Other survivors were black—as are the majority of the dead, researchers believe. But although the boys at the Dozier School were segregated by race, white and black boys suffered together. Jacksonville resident Cocomo Rock, who is black and sports dreadlocks, was sent to Dozier in August of 1966, when he was eleven. He lived there 22 months. As he listened to Stephens recall his time at Dozier, he could relate all too well. “I counted every day and every moment I was here,” Rock said. Another survivor tells a story about how he found a single bright pebble to train his thoughts away from his White House beating, held it oh-so-tight to forget the pain—and still keeps the pebble in his pocket to this day. Burials records at Boot Hill stretch from 1914 to 1952, although the report cites school-related Dozier deaths until 1973. The culture of abuse, survivors say, lasted beyond the last recorded school death in 1952. The reformatory was all wrong from the start. According to the USF report, Florida led six investigations into the “school” in its first thirteen years. Boys in chains. Boys whipped mercilessly. Boys leased out for labor. 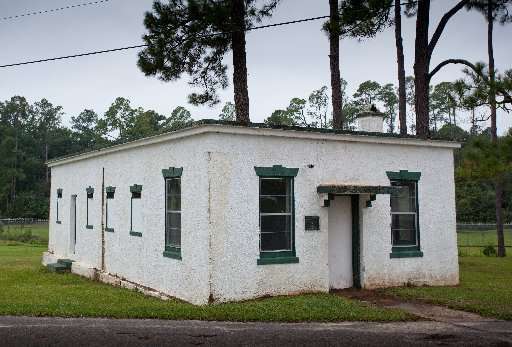 In Florida, prisoners were in a convict lease system. (In the wake of bogus vagrancy laws, according to the USF report, Florida’s black prison population rose dramatically, with convicts turned over to labor agents.) And the Dozier School was a labor farm—which, despite its name, never had desks in its early years, according to the USF report. Boys were put to work. Were boys shot or mauled while trying to escape? Or was “trying to escape” a euphemism for random offenses at the jailers’ discretion? 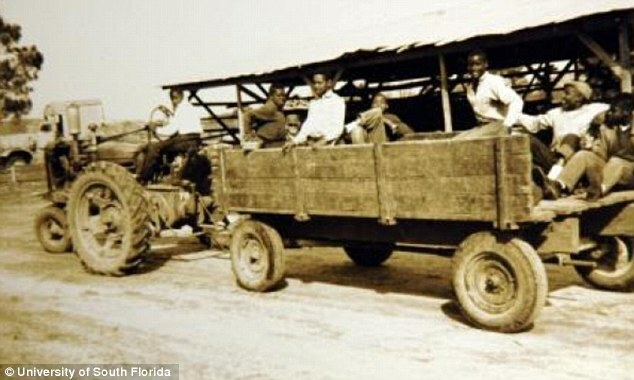 Remember: the Dozier School is set against set against the backdrop of bitter racial hatred and oppressive Jim Crow laws of Florida’s past. A former juvenile inmate said at the April 2013 meeting that Dozier guards “set the dogs on you” if children tried to run. And enough boys died at the Dozier School that it had its own cemetery. Surviving records indicate that the institution tended to underreport the actual number of deaths. “These are children who came here and died for one reason or another and quite literally have been lost in the woods,” Kimmerle told CNN. “It’s about restoring dignity and if not putting a name to them, at least acknowledging and marking that they’re here.” SEE KIMMERLE ON CNN HERE. Ultimately, the state of Florida’s legislature approved $90,000 for the excavation. The U.S. Justice Department gave another $423,000 to match DNA from the remains to family members. We hear you, children. We hear you.